Bodkin Design and Engineering Announces New Line of Customizable Single Point and Differential Blackbody Systems. Bodkin Design Develops Special Purpose Infrared Equipment for Precise Radiometric Calibration. 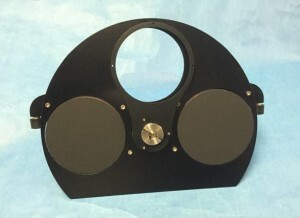 BD&E’s Latest Design: Dual-temperature blackbody for two point calibration. Bodkin Design and Engineering LLC (BD&E), an electro-optic systems and solutions design-to-build firm, is pleased to announce a new line of thermo-electrically driven blackbody radiometric reference sources available immediately in stock or customized models. BD&E develops next generation infrared (IR) equipment according to exacting standards that provide precise IR emission over the Mid-Wave Infrared (MWIR) and Long Wave Infrared (LWIR) spectral bands. These products are built for applications such as thermal imaging calibration, target projection, and infrared detector/pyrometer characterization. USB connectivity allows radiometric calibration and correction to be accomplished using single-point, two-point, or on-the-fly methods, infinity focus testing, and Minimum Resolvable Temperature Difference (MRTD) measurements. Available in different sizes, the rapid blackbody systems and accessories available from BD&E include the MRDT-50 Differential Blackbody, MRDT-X Differential Blackbody, BB-100 Single Point Blackbody, OEM Blackbodies, BBC-58 Collimator, and customized blackbody resolution targets. BD&E also offers custom-engineered products to suit your specific requirements. Bodkin Design and Engineering, LLC has been providing concept development, prototype design/build, and engineering services since 1992. Headquartered in Newton, Massachusetts, the company serves the OEM, commercial, military, and research communities. Specializing in cutting-edge technology, BD&E has overseen the successful introduction of products ranging from miniature infrared cameras and spectrometers to heavy equipment for railroad yards.